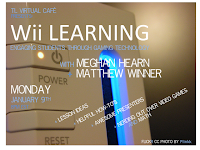 Last week I had the opportunity to listen in on a webinar titled "Wii Learning: Engaging Students through Gaming Technology," presented by Meghan Hearn and Matthew C. Winner. As the title suggests, the speakers shared how they use the Wii (and other gaming "toys") as a learning tool. They specifically looked at how students can practice math skills and vocabulary in real-world scenarios. "How Social Gaming is Improving Education" (Mashable, 2010) takes a cursory look at educational gaming and how it can create a fun and engaging learning environment. The curated topic are you game gathers some great reading material on the topic game based learning. Educational Games Research blog surveys the current research in educational gaming, providing suggestions for implementation and commentary. Microsoft's Games for Learning Institute supports research in educational gaming. The site includes links to math and science games, as well as research supporting the use of games in learning. "Penn State’s Educational Gaming Commons is a group devoted to to exploration of games as a tool to improve teaching, learning and research." There a 8 games available for use. Some require a Penn State login, but the game descriptions may inspire you to create a small scale game for your classroom. One that is accessible without Penn State credentials is Chemblaster, a game that will help students recall core chemistry concepts. Have an idea but don't know where to begin? Looking for a brainstorming partner? Contact Mrs. Bond.